Maruthi Rao. 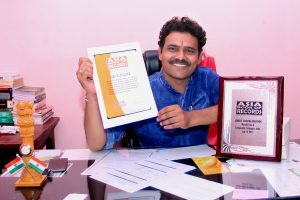 B (born on March 14, 1976) of Sangareddy, Telangana, performed 150hrs teaching marathon on the subject ‘Taxation and Accounts’ starting from 8:00a.m, March 9, 2015 and ending at 6:00p.m, March 15, 2015, at Vashista Degree College, Zaheerabad, Telangana. Comments for LONGEST TEACHING MARATHON are now closed.